Cook the spelt according to the package instructions in the vegetable stock until soft, drain and let it cool down. Roast the California walnut kernels without any fat in a pan and chop them coarsely. Peel the lower end of the asparagus and cut it into medium size, diagonal pieces. Pour some olive oil into the pan and roast the asparagus with some garlic. Clean the radish and cut them into equal slices. Mix the rest of the olive oil with lemon juice and season to taste with salt and pepper. 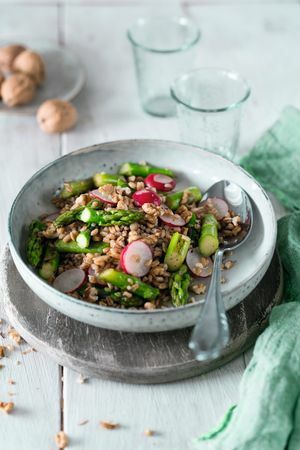 Now mix the lukewarm asparagus with olive oil, garlic, radish, roasted California walnuts and spelt in a big bowl and pour the dressing over the salad. Mix everything together and season according to your taste.